If you watched yesterday's video I mentioned that I was working up some stoneware reclaim and that I was going to go over to the cemetery near our house and get some local red dirt to add. The cemetery has a big pile of dirt from when they dig graves. I brought some of that dirt home and ran it through a course screen to remove the roots and rocks. Below you see the screened dirt alongside 2 buckets of reclaim. I added all the dirt to one bucket and this was the result. I want to throw this clay fairly soon, so I needed to add some more dry material to stiffen it up a bit. 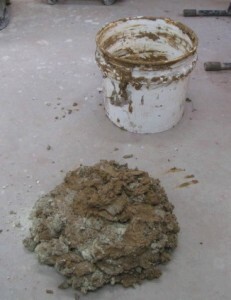 I added some ball clay and dumped it on the cement floor so I could wedge it up. Below is the result. So I'll let these balls sit for a day or so under plastic before wedging it up and making some pots. 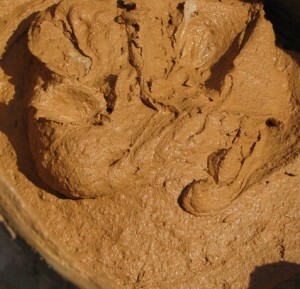 I'm not sure how that local dirt will effect the color of the clay or the glazes or slips I will be using. The pots are going in a wood fired soda kiln. I didn't really measure anything which was part of the fun. 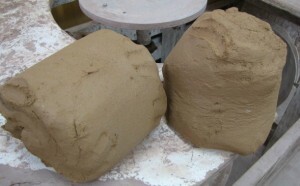 I will fire some test bars to make sure the clay will go to cone 10 before committing the pots to the firing. I'm pretty sure it should be fine as the main reclaim body is high in Goldart clay. Still waiting on the kiln to cool. New photos should be up by tomorrow morning at the latest.